I love shopping at the big warehouse stores. If you’re at least a bit observant with the prices, you can find some very solid discounts there. 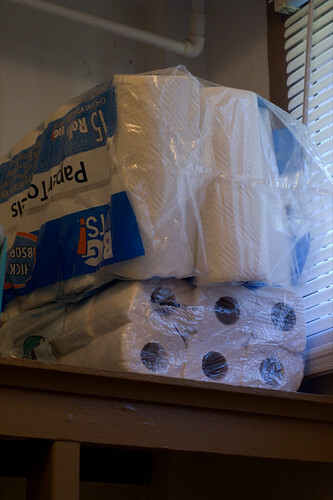 The only problem is that in order to get those discounts, you have to walk out the door with a pack of 36 rolls of paper towels or several hundred trash bags or a six-pack of air fresheners. The cost per item in these big packs can be much lower than what you would buy elsewhere, but you have to deal with the sheer bulk of it. Right now, we live in an adequately large house with some nice storage space for this stuff. We actually have shelves out in our garage where we store lots of extra rolls of toilet paper and other such things. Not too long ago, though, we lived in an apartment with almost no storage space at all. It was hard to really take advantage of the lower prices of bulk buying. If you have friends, though, you can take care of that problem pretty easily. The best way to do it is to get together with a friend or two to effectively share a warehouse store membership. Split the annual cost of that membership – taking it down to $20 or so – and then split the larger bulk buys in half. Let’s say, for example, that the toilet paper you prefer is bought in a four pack at your local grocery store for $2. At the warehouse club, though, you can buy a 36 pack of that same exact toilet paper for $12. At your local store, the cost per roll is $0.50, but at the warehouse club, it’s $0.33. The only problem is the storage space. So, all you do is have each of you contribute $6 to the purchase of the jumbo pack and each of you take home 18 rolls. Or, if you have a third friend involved, each of you contribute $4 and take home 12 rolls. You’re essentially tapping into a “buy two, get one free” sale on these because you’re cooperating with a friend, and you’re cutting down on the sheer bulk of the items you need to store. How do you functionally do this, though? You can shop together at the warehouse stores. One good way to do this is to have each of you push around a cart, compare shopping lists as you go, and have you each buy a roughly equal amount of the large bulk items that you’ll share. For example, you might decide on $80 in bulk items that you each want half of, so you’ll each buy $40 worth of those items and then just split them up when you get home. Another option is to compare lists before you go. You can do this with any friend. All you do is look for the items you have in common on your grocery lists, then just one of you goes to the store and buys those common items in bulk. Purchase those common items on one receipt, then go home and split them up and have the other person pay you half of the total of that receipt. Bulk buying can save you a lot of money, but if you do it with a friend, you can both save without having a ton of storage space.